Tuxedo & I have lurked here for a while, since May 11 to be specific. Heck I even have 2 accounts (could not remember the password on the first and every attempt to reset it resulted in a notice saying my password reset link was invalid … site administration might want to be aware of that issue). While I stole strength & hope from those here by reading their stories, I hesitated to share mine because I was so upset that I could not. Everytime I tried to type my eyes flooded with tears. They are doing that now, but since things are semi stable now I hope my share may be of help to someone else in their time of need, just as those on this site were of comfort to me. Unfortunately both Tuxedo & I will likely never forget that day because when I was getting out of my car a large dog rushed towards me. Tuxedo, my 9 year old cat, dove between me and that dog, buying me time to react. Unfortunately that selfless act was very costly on his part. By the time I was able to beat the dog off with my cane, Tuxedo was not in good shape. Tuxedo was bleeding badly from numerous wounds and one of his hind legs was almost severed. I have never heard such rage & painfilled sounds in my life like those coming from Tuxedo as I rushed him to the emergency vet clinic. In a twisted way, I also took comfort from the sounds, because they meant my little fighter was still alive & had not given up. Several hours, tests, xrays, and surgeies later, Tuxedo was stabilized. As expected, the one hind leg was amputated. His other injuries were cleaned & stitched. Amazingly enough they missed all vital spots. He must have been doped up well, because he was standing less than five hours after he came out of anesthesia. Tuxedo hates cages and made that fact well known at the vet. So I was heavily encouraged to take him home as soon as possible. I am still amazed at the volume of sound a severely injured small cat can generate when he is not happy. All should be better at home, I hoped. But unfortunately it was not. I am sure my general instructions were like those given to others, keep him on his meds, keep him quiet and resting. Tuxedo came home in one of the soft cones to prevent him from getting to most of his wounds. He quickly figured out that if he pushed the edge of the cone on something, he could flip it backward and wear it like a cape around his shoulders. I was continually moving it back into place. You would swear that cat was Hoodini as often as he slipped out of that thing. I finally gave up on the cone after finding him with both of his front legs caught in it as well as his head. All the while, he refused to eat & drink. He would even spit his meds out as soon as I would leave the room. I lost count of how many times I ended up washing his chin as all his meds were in liquid form. I literally bought every brand of cat food I could find. Nope, he was not interested. Tuna, chicken broth? Nahh. Just in case it helps others, I finally found one brand of cat treats that he would eat, Delectables. He has been getting a steady diet of that since. I am sure he must have been in considerable pain at one point since he crawled under my bed, shredded a pillow which was filled with tiny foam balls and proceeded to hide in that for three days straight. All I could do was peek at him to see if he was breathing. I contemplated calling for help to get him out and take him to the vet, but decided that due to his hatred of vets & cages that if he chose to go to the bridge I was going to let him do it on his own terms. Though I wavered on this many times. Then one morning, he crawled out, looking like some freakish snow creature, all covered with those tiny foam pellets. I wish I had taken the time to snap a picture. After that I thought things were going smoothly, until approximately ten days after the initial surgeries. Then suddenly his incision opened up. Back to the emergency vet & more surgery. He had developed a severe infection in the wound. Ok, this time when he came home, he had a tight plastic cone, and bandages sewed in place. And he had to go back every three days to be knocked out and get them changed. This was not a happy period in time for him. 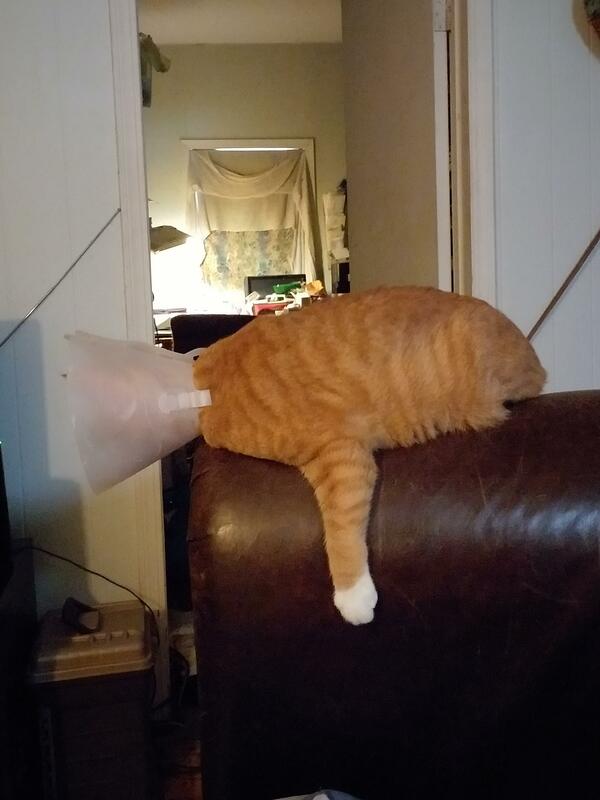 He hated that cone and would bash his head against everything in hopes of removing it. I also have another cat, a very timid one who used to be best buddies with Tuxedo & now suddenly did not recognize Tuxedo and would smack him every time he wandered within range. And Tuxedo would not stay still. He roamed everywhere. It was like he was on a mission to prove he could do everything he set his mind to trying. Luckily, there seems to be a happy ending. After three weeks, all bandages & the cone were removed. No more continual vet trips. The open wound has closed. Yes, it has resulted in a nasty looking scar, but my house is no longer a war zone. No more cone and the two cats are now best buddies. With them even sleeping together again. I read lots saying that older cats like Tuxedo have a hard time adjusting to an amputation, that three legged cats have trouble jumping, etc. Well perhaps that is true, but just now 7 weeks out and this little guy (with all his issues) seems determined to prove them wrong as he plops onto my desk and fights me for keyboard control. Hi Tuxedo and family, welcome. Thank yo uso much for sharing your story, it’s definitely helpful and hopeful to others who are just starting their journey! I apologize for the brief reply but I’m out the door and will be back later. Just wanted to make sure everyone saw this, because you and Tuxedo deserve HUGE APPLAWSE!!! Hi! Sounds like Tuxedo is doing great! And what a warrior! I have never heard of a cat protecting his person – just amazing. There is a new blogger – My Cat’s Leg – who just posted about some problems with her cats getting along with a new amputee. Sounds like you might have had a similar issue? Maybe hop over to her blog, I am sure your experiences could be really helpful. Thanks for sharing Tuxedo’s story! We are glad you stopped lurking and posted;) We are all here to help each other get thru these things! I hope you did find some help, hope and inspiration by lurking! I’m sorry to hear Tuxedo had a rough recovery ! So Glad to hear that things have greatly improved & you found the courage to post and share Tuxedo’s story ! Glad to hear you no longer have a war zone and Tuxedo is determined to show you what a Tripawd kitty can do!!! Our cat Purrkins lost his left front arm from cancer its going to be 1 year at the end of this month ! Purrkins gets around fantastic he just turned 7 years old. We encountered it when Purrkins had cancer and for a period of time after his surgery! We kept them separated in recovery & allowed supervised visits. Then slowly got them back to being brothers! We used a feliway multicat diffuser and it helped us! It wasn’t a 100% fix but it helped! I would recommend it to anyone having a multi-cat aggression issues! Keep it up Tuxedo show your Mom that trikitties do have more fun! I know Purrkins sure does! Chin & ear scratches to Tuxedo! Despite his small size, Tuxedo has always been something of a fighter, almost to the point of being a bully. So his attacking to protect me was not a big surprise. He lays into anything which ventures into his turf. Of course he usually has backup, namely Dazzle (his brother) & myself to keep him safe. I just was not fast enough this time. But I truly do appreciate the sacrifice he made as the only injuries I got from this encounter were from Tuxedo while placing him in a carrier for transportation. I know it likely would have been different without him. I know it says to keep the pets separate, but I never did that. I just made sure the home front was constantly monitored and that there were two of everything (food bowls, litterboxes, water dishes, perches, etc.) And of course the trusty water pistol. I do not think it was smell in my case which caused the problem, but rather the cone. As soon as it was removed for good, the snuggling began again. I just read your story and wow, what a lot to go through. They are both adorable kitties and Tuxedo certainly sounds like a spunky little fighter! Dragon slayer indeed. Best wishes for a speedy recovery, hopefully with the worst of the bumps behind you! Wow, what a story. Tuxedo is truly a hero. 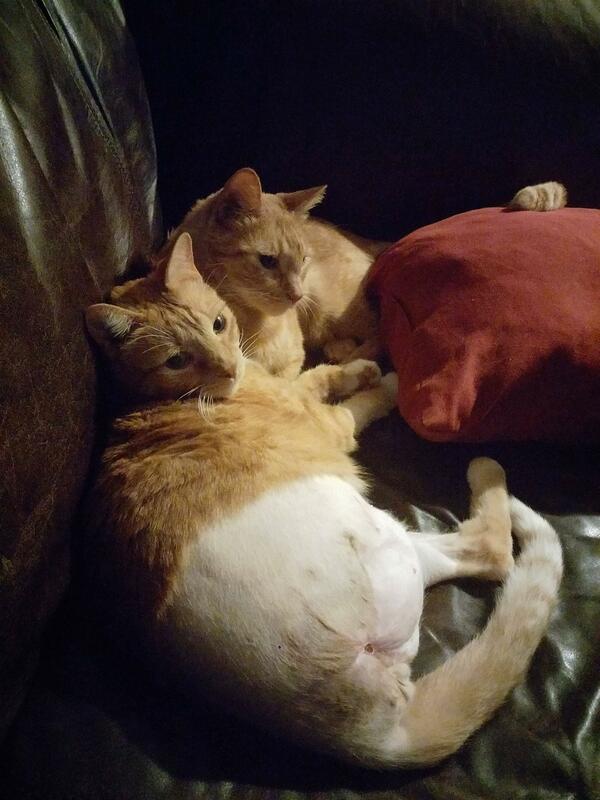 My kitty Mona had her front leg amputated 3 years ago and my male Eli was very sweet to her when she got home, although she likes to bonk him on his head. I’m glad to hear that your cats are doing well together. It always makes me laugh when a dog or cat is so feisty at vet clinic that the pet is sent home as soon as possible. My vet thought Mona was the sweetest cat that he even took her to his house over night! She was wonderful for him but a little terror when I took her home! I’m glad you posted here to tell us about your ordeal. Very frightening for you I’m sure. Do you happen to know where the dog lives? If so you can ask (or sue) the owners to cover all of Tuxedo’s medical costs. Usually house insurance covers pets who damage others property (Tuxedo is your property). I sure wish I knew whose dog it was. Because if I did, I and others in my neighborhood would probably be doing a lot more than suing. As you likely know, the type of vet bills for this are considerable, esp to someone on a fixed income. But Tuxedo is definitely worth the cost. Rather than being a disadvantage though that fixed income bit likely helps in other ways. Since I can not afford all the specially made tripawd type items & I have to find/make my own substitutes (such as using an old pizza box for low side litterpan & towel stuffed poufs for kitty stairs/ramps). I suspect some of my creations might be of use to others too. So if someone gets stuck needing something, let me know. I am very creative. In addition to being my watch dog, Tuxedo is also my constant companion. In the past, the little dude would only leave my presence when I would let him go outdoors. No more outdoors for him for quite some time I think though. Since that dog attacked Tuxedo, it has gotten a few other cats, small dogs, and even one child. That animal is definitely a menace. I suspect his days are numbered though as animal control is on the lookout for him. So I now am being treated to almost more hours of uninterrupted Tuxedo love than I can tolerate. I must find him a new hobby besides crawling all over me and kneading my head! Dawna, you are best kittie parent! I didn’t spend any additional money on my tripawd Mona. I did cut down a litter box for her but she refused to use it. I’m sure that Tuxedo will eventually go back to using his regular litter box. As for stairs, I used cardboard boxes, chairs, little tables. Mona eventually chose what she liked. The boxes became another sleeping station for her brother Eli so she makes a fuss to get him off or may give him a bonk on his head. Tuxedo is a love boy and just letting you know how much he loves you. Your cats are very beautiful. Scratches to both of them. p.s. I hope that dog is found soon. It’s terrible that people and pets are being terrorized. Love these two Tuxedo & Dazzle OMC 2 ginger tabbies! How sweet! Being treated to almost hours of uninterrupted Tuxedo love sounds fantastic you can find Tuxedo a new hobby, but I bet the crawling all over you and kneading your head will remain! The kneading is the ultimate love !! Your Momma cat! Purrkins does the same to me!! We love seeing pictures thanks for sharing these 2 special souls! Please report when the dog warden finds the menace! Just happy to see Tuxedo survived all of this!